The Grand Cinema is the South Sound's nonprofit home for independent, foreign and local film. Our mission: The Grand Cinema enriches lives and enhances the cultural vitality of the Greater Tacoma community through the art of film. As a nonprofit, we are supported by loyal patrons, volunteers, small staff and Board of Directors. 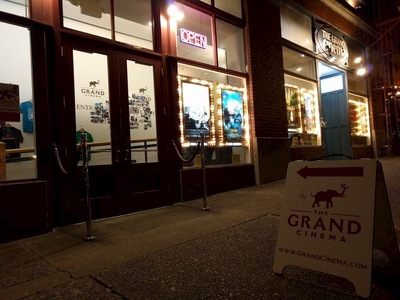 In addition to screening independent, first-run films 365 days per year, The Grand is also the proud host of the Tacoma Film Festival, Tacoma Film Camp, 253 Short Film Party and many other unique film programs and special events. We love featuring locally made products in theater when ever possible. Find a selection of beers and wines made in Tacoma and the Pacific Northwest, as well as locally baked cookies, and ice cream made in Tacoma using locally sourced ingredients. Located in the historic Merlino Arts Center, all four of our theaters are ADA approved and wheel-chair accessible. Hearing assistance devices are available at the ticket counter, and films are shown in open captions every Wednesday for our Deaf and hard of hearing patrons. Please ask our staff for assistance if you need accommodations while visiting our theaters. As a community-based organization, we offer our spaces for rental use and to host events. To learn more about hosting a film screening or planning an event in our lower lobby, see birthday parties or rentals. See what awards we've won in the community and around the region.